So, I disappeared again. I had all these grand plans for more frequent posting, but you know what they say about that whole "best laid plans" thing. At least this time I have a decent excuse: we moved to Boston! That's right, I am a city girl now. I am still cooking (constantly), only now it is in a tiny apartment kitchen on a correspondingly small apartment stove. A miniature stove, however, is a small price to pay for high ceilings and hardwood floors (and I can't forget the Whole Foods within walking distance). Now that we are (kinda, sorta) settled in our new place, I really am going to be posting more often. To give myself a bit more motivation, I have decided to participate in French Fridays with Dorie. We are going to be cooking along with Dorie Greenspan's new cookbook, Around my French Table. I am really excited about this because I haven't cooked much French food, and I am always looking to expand my culinary horizons. Also, it gives me an excuse to buy a new cookbook; something that makes my boyfriend and our overstuffed bookcases groan and also something I (kinda, sorta) promised myself that I wouldn't do. But come on, this is Dorie, and my copy of Baking: From my Home to Yours was looking rather lonely. I was happy to find out that the inaugural dish of FFwD was gougeres, cheese puffs made from pate a choux, because I have been wanting to make them for a while now. Now that I have whipped up a batch, I am kicking myself for waiting so long because these are fantastic and so easy to make. 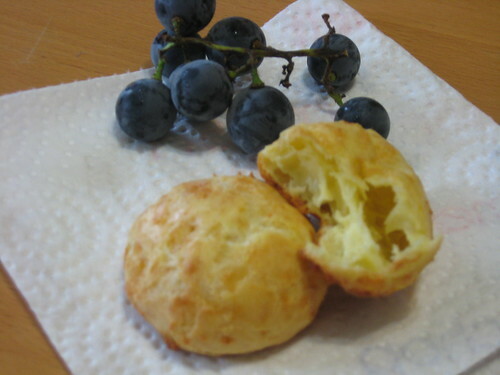 These gougeres are light and airy, and the cheese flavor is deliciously strong. 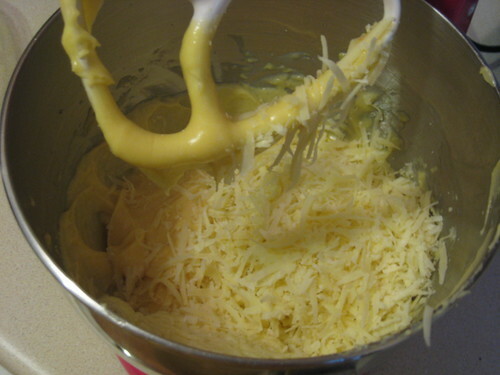 I used a high quality Gruyere (my favorite - the stinkier the better), but Dorie says that also makes them with cheddar. 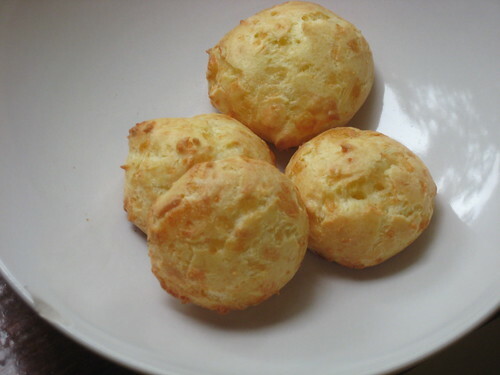 I love the straightforward cheese flavor of the Gruyere gougeres, but I think that a cheddar version would make an excellent vehicle for some sort of filling (they are made from the same base as cream puffs, after all). Right now I am imagining a chicken or seafood salad, or perhaps some sort of chutney or jam. I am looking forward to experimenting with this recipe, but, more immediately, I am looking forward to dinner tonight: hot from the oven gougeres (I baked off six for my test batch and froze the rest for later), some thinly sliced sopressata, a big pile of lightly dressed greens, and a bunch of gorgeous purple grapes. Oh, and wine, of course. It is the natural partner of the gougere, and a perfect way to toast the kickoff of French Fridays. Head over here to see a parade of gorgeous gougeres from the FFwD crew. Perfect gougeres! I used cheddar and agree that they would be perfect for sandwiches.